POMBAL, Brazil, Aug 2 2018 (IPS) - “The sun which used to torment us now blesses us,” said one of the 19 women who run the Community Bakery of Varzea Comprida dos Oliveiras, a settlement in the rural area of Pombal, a municipality of the state of Paraiba, in Brazil’s semi-arid Northeast. 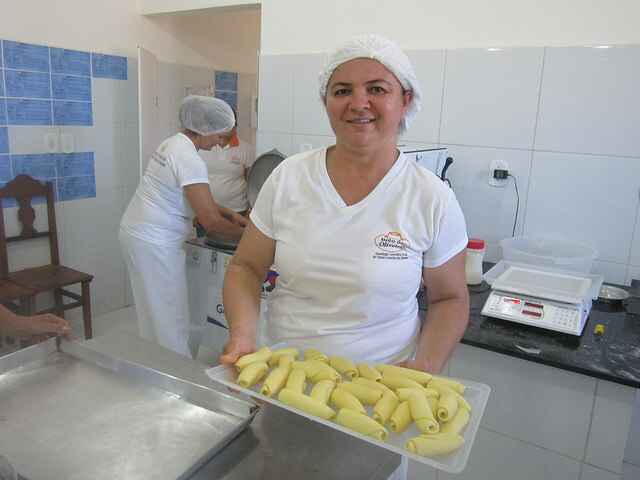 “Without solar energy our bakery would be closed, we would have to pay more than a thousand reais (268 dollars) a month for electricity,” said Glauciene Ferreira Freire, 34, an agronomist with a master’s degree in agro-industrial systems who presides over the association. The apparently low energy cost is due to the still limited production that is focused more on sweet pastries than on bread. The ‘Bolo das Oliveiras’ (Oliveiras pastries) – their brand – factory only operates three days a week. The 19 women who work there take turns in three groups working on Mondays, Wednesdays and Saturdays. Sometimes, usually every two weeks, a group covers orders from schools on Tuesdays. On the day IPS visited the community, the group worked from midnight to 3 p.m., without a break, to make 406 kg of baked goods. They earn very little; every two or three months the net profits are distributed. Last time it was 500 reais (135 dollars) each. But it is not just a business, and has great possibilities for expansion. Community life was revitalised by the women, and the bakery’s need for inputs foments greater local production of potatoes, milk, butter, eggs, cassava, carrots and maize, that thus gain added value. “The women have gained more respect,” said Solange de Oliveira, 42, president of the Community Association, which represents the 84 families in the community. “In addition to the extra income, our lives improved with the integration of neighbours and recognition outside the community,” said Irismar Matos, 52, who has two adult children. The community began to receive visits from government officials, religious authorities, and foreigners interested in the project. The photovoltaic system installed in the bakery means more than just having their own electricity. “It brought knowledge, experience in collective work, self-esteem,” said Cesar Nóbrega, coordinator of the Semi-Arid Renewable Energy Committee (CERSA). It was CERSA, a group of activists, academic researchers, social organisations and various associations, which provided, with resources from the CASA Social-Environmental Fund, the facilities for the generation of energy. In addition to the equipment, it offered courses on the meaning and operation of solar energy to dozens of local people. Varzea Comprida dos Oliveiras is a traditional community of family farmers, dedicated to the production of vegetables, corn, beans, fruit and milk in Brazil’s semi-arid Northeast, which suffered a severe drought in the last six years. The active local association promotes agro-industrial activities, which is why it has attracted the interest of CERSA in turning it into a pioneering example of the successful use of solar energy. It is part of a regional trend. In the same municipality of Pombal, another rural community, São João, created the Fonte de Sabor Agro-industry, which processes fruit pulp. Here too, solar energy played an important role, reducing costs by 70 percent. Brazil’s semi-arid ecoregion, home to some 24 million people, one-third of whom live in the countryside, is an area of intense sunshine, a factor in agricultural losses and evaporation that aggravates droughts, but which is now becoming a positive aspect due to the growing use of solar energy. 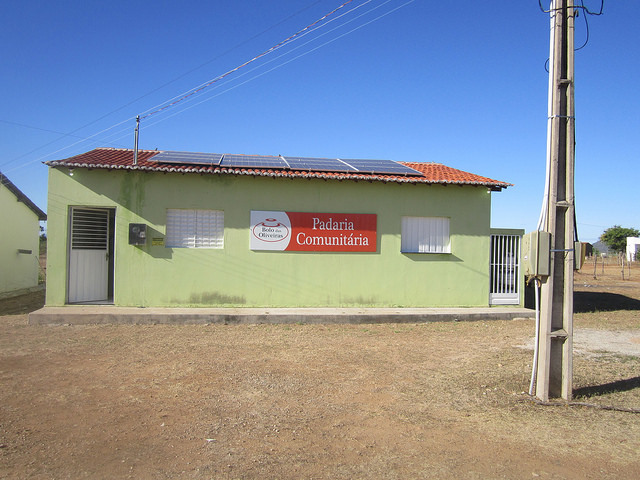 In Varzea dos Oliveiras, where families have little land, most of them only half a hectare, the alternatives are growing vegetables and collective initiatives, according to Aires Umberto Vieira, a social issues advisor to the local Catholic diocese that supported the construction of the solar-powered bakery. Marketing is the bottleneck faced by the bakery, which relies heavily on the National School Feeding Programme, which stipulates that 30 percent of the food served to students in public elementary and secondary schools must be purchased locally from family farmers. “Of a contract of 105,000 reais (about 28,000 dollars) to supply public schools this year, only18 percent has been met” by mid-year, complained Oliveira, the president of the Community Association. The bakery has been in operation since December 2016, but it took several years of battle and some uncertainty to get it up and running. Many women in the community already made pastries and other baked goods in their homes to sell to neighbours, or at street fairs, as a source of additional income. They then decided to produce them collectively. First, in May 2015, they got the equipment and a van from the municipal and state governments, but had nowhere to set up a bakery. 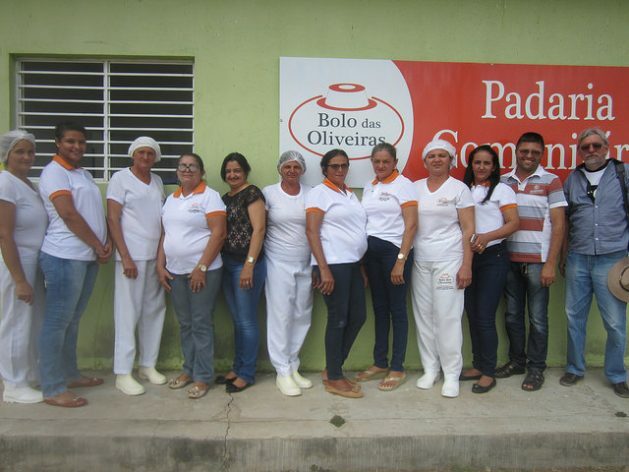 Then, with the support of the diocese and Vieira, they received assistance from the Vatican’s Populorum Progressio Foundation to build the bakery. Finally, the project was made possible by the solar energy provided by CERSA and the CASA Fund. “My desire is to extend that energy to all families,” so that everyone can save on their electricity bills, said Oliveira. The usual form of microgeneration by photovoltaic panels in each household is not viable because they are low consumption families who pay subsidised electricity rates. As long as consumers cannot sell surplus energy that they generate themselves, but can only use it to reduce their own electricity bills, microgeneration is not worth it for households. In other words, they have nothing to gain from producing a surplus. For the poor, including small farmers in general, any photovoltaic panel would be too expensive and would produce more than what they need. But Nóbrega believes that if they organise in cooperatives they could benefit from this alternative. Meanwhile, the community of Oliveiras is preparing to rely on another energy source, biogas, produced in a biodigester, accompanied by systems of purification, compression and packaging of the gas in the bottles used for cooking gas (butane). 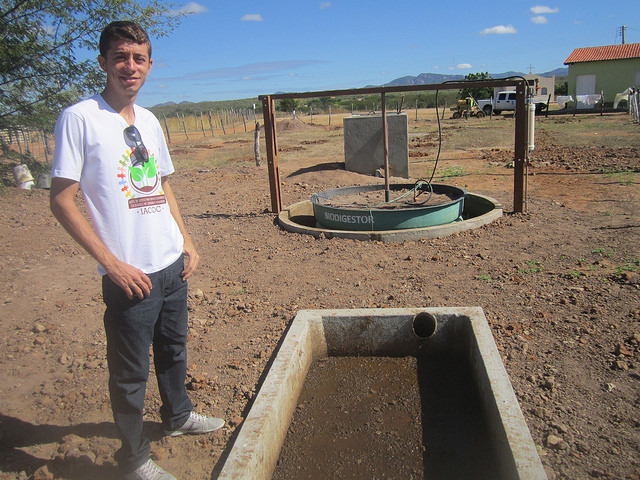 The project offered by the Agribusiness Incubator of Cooperatives, Community Organisations and Rural Settlements of Paraiba (IACOC), produces 7.8 bottles of biogas per month, said Joaquim de Souza Neto, a student of environmental engineering who runs it. A second biodigester will double that production, allowing more savings or additional income for the community. In addition, the process, which uses cattle manure as an input, produces a natural fertiliser for orchards that will also generate future income, announced de Souza Neto, a student at the Federal University of Campina Grande’s Pombal campus, where IACOC is based. These energy alternatives promise a better future for farming families, whose children try to study, despite the difficulty in getting to school due to the precarious transportation. The community of Oliveiras already has nine graduates and three others studying at the university.